Never, never ever discount a note. Experience, trial and error have shown me time and again that there is an interpretation you are going to like, of every note imaginable. Don’t like jasmine? Try By Kilian Love and Tears or Ormonde Jayne Sampaquita. Don’t like vetiver? Try Hermessence Vetiver Tonka or Parfumerie Generale Cedre Sandaraque. Don’t like Tuberose? Take a look at By Kilian Beyond Love and take a long hard look at this Mona di Orio creation. You might be swayed. I know I was. Created in 2011 by Mona di Orio, Tubéreuse includes notes of pink pepper, bergamot from Calabria, green leaves, Indian tuberose absolute, Siamese benzoin, heliotrope, amber, coconut milk and musk. Before we dive into the review of the scent, here is a little bit about the creator – Mona di Orio. Mona was a pupil of the great Edmond Roudnitska (whose ode to his wife Le Parfum de Thèrése is very dear to my heart). She studied with him for years and ran his laboratory after his death. She started out on her own and created several perfumes under her name. Her new line is called Les Ombres d’Or, the golden Numbers, referring to the golden ratio, a mathematical set of proportions often used in the arts, especially in the renaissance. She tries to find the perfect proportion of ingredients in her perfumes, each centered around a single note. 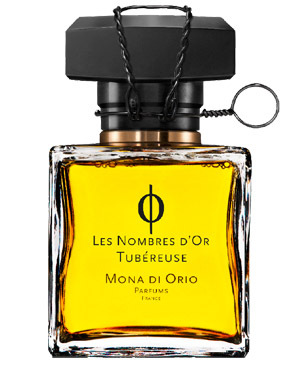 Mona di Orio’s interpretation does away with the heavy, intoxicating headiness of this night-blooming flower and gives us a greener, fresher, but still very much sensual and seductive version of tuberose. Tubéreuse opens fresh – bergamot and pink pepper give a spicy start to a floral note that is soft and green. The tuberose as we know it, is there, but muted, veiled, softened accented by green and sweet notes of benzoin and amber, an almond-y facet from heliotrope aided by coconut, give a faint tropical cast to this perfume without ever getting close to cocktail territory. The freshness of the first half hour slowly fades and leaves us with a soft, warm and sweet floral fragrance that is understated and extremely wearable. I have no problem whatsoever, wearing this during the day. This entry was posted in Floral, Fragrance Reviews, Mona di Orio, Tuberose and tagged floral, Fragrance, Les Nombres d'Or, Mona di Orio, Perfume, Review, Tubereuse, Tuberose. Bookmark the permalink. I’m not going to gloat (ok, maybe just a little bit) 😉 – it’s so good that you found a tuberose for you (and oud, but that’s another story). Have you tried Mayotte perhaps? For me it is rather a case of “white flower fear” but I am getting over it. Every time I had to smell a white floral I had to run gasping for air (and running water). Trying Amouage Gold for Men didn’t help either: horrifying experience… But gradually I got over it. Sarrasins helped. Parfum DelRae Amoureuse helped. And form the sounds of it Mona’s Tubereuse is a must try. I agree with Ines, there is one for everybody out there. Orange blossom is the final frontier for me. I am open to suggestions but I still haven’t found one that doesn’t smell pissy…. OK looks like I must try Beyond Love again! Glad you have found a tuberose to love. I haven’t tried any of Mona di Orio’s line yet but they sound great and I’m looking forward to further reviews from you. I found I liked oud after Rose Oud and Nuit de Tubereuse has been growing on me. You may well be depriving yourself in the long run by not trying any perfumes with a note you dislike – you just never know! It’s all about the quality of the material and the composition as a whole, I think. I have been trying for over a year now to love Nuit de Tubereuse, but it just is far too strident on my skin, I feel like I’m turning into an android when I wear it! Oh well…. I can’t get into liking Nuit de Tubereuse either, it turns quite sour on me. There you go again making a perfume sound Irresistible, I have just had to order this sample as curiosity got the better of me. I await the perfume with anticipation. I have been tempted to try Mona di Orio’s line so this one seemed like a good place to start with such a lovely review. Ha, I’m happy my review made you try this. Unfortunately I have a few more Mona reviews in the works, a really satisfying line. The only Mona d I’ve tried is Amyitis, and I was quite fascinated with it. So weird! So creepy, almost…. But it sort of took over the scenery, and I didn’t buy more than a decant. If this new line is more wearable, I very much have to order a sample set, Mona d is a very unique olfactory artist! I think the new line is totally different from the old in terms of wearability, if not quality and creativity, that has stayed the same. I was just thinking about the differences in the previous and Nombre d’Or line. It seems to me that while Mona retained the actual perfumey feel of her perfumes, the Nombres seem more approachable to wider public in terms of appreciations and liking them. It took me quite a while for the first line to grow on me (but it did), and this one was instant love. Isabelle, perfume is really an exiting adventure! There will be more Kilian as well as Mona di Orio reviews coming in the next weeks, I am very happy with both of these lines. Please let me know, how you get on with your new samples, once they arrive. There is something potentially witchy about Mona di Orio and the way she composes perfumes, and I mean that in a good way. I love Tubereuse, in fact, I love everything I’ve tried of the new line. Needless to say, I’m VERY excited to try Oud. Some things are just worth the money, and I have a feeling that this will be one of them. Personally, I need a full bottle of Vanille as soon as possible. It’s outstanding. I totally agree, some things are worth the money! I think of Mona as a magician, but a good witch is even more fitting. Vanille is awesome, it is on my wishlist as well. A withcy alchemist, she definitely is. This sounds pretty- but I cannot wait for your review of the Oud..I do love many other aoud based fragrances too (including the By Killian ones and some of the Montales(specifically Black Oud)), so wondering if I would still love this oud? That Oud does sound enticing, doesn’t it? 🙂 I think you will like it, the question is how much you will still like the Montale after smelling MdO Oud… Review is coming next week. This is a serious candidate for THE BEST of the newest releases I have smelled lately. To me it is BY FAR, even better than OIRO. This is a beauty of scent that grows incredibly on me, always close to my skin and never overpowering the senses. It’s difficult to say…, but I think I love this even more than the By Kilian Sweet Redemption. Yes… here’s no childhood memories, no flashbacks, no sentimental effect… but after all, although I’m usually so damn romantic for a while, most of the time I’m not wearing perfume to get involved in a emotional spiral, but just to get extremely pleasure (above all, I’m hedonist!!) and if there’s one thing I like even more than the tenderness, that is sultriness…. This perfume has the TWO freaky things at once! Anyway, I’ll sleep on the issue and coming to the right conclusion (I hope you’ll have this available, too?! oooh pleaseeeeeee say yes). I have a little bit to sell, yes. So no worries. Take your time and when you are ready just shoot me an email. I’d love to try this perfume…and Fracas…. and Carnal Flower…..I’m not sure how I’d choose which one is the best, though, it’s so difficult to spray a bit on in a shop and then come home and decide. Hmmmmm … there’s a Harvey Nicks in Bristol, I hope they have all three in stock. Thank you for a beautiful blog. welcome! It is always a good idea to sample extensively before committing to a full bottle. You seem to love Tuberose, and those three perfumes you mention are very different renditions of the note, but all three are beautiful. Thank you for the welcome… I had NO idea that there were perfume lovers out there like me!!! It is blissful looking at your blog. I’ve been trying since I last posted to get the Tubereuse…..any links to where I can get it? I think I should go for this one, first, and see how I go. It’s so infuriating, I used to live in Paris, but I’m out here in rural Oxfordshire and there is a distinct absence of good perfumeries around and abouts. Hmmmmm…. The Mona di Orio perfumes are available through Les Senteurs in London, or First in Fragrance in Germany who ship samples throughout Europe. Also there is the possibility to order minis (7ml) directly through the Mona di Orio website (www.monadiorio.com) from Amsterdam. Over here it is not much better unfortunately, which is sad. But if you come to London now and again, Nick at Les Senteurs in Marble Arch is amazing, the most dedicated and knowledgeable SA in existence. That is a fantastic option, especially since the other perfumes in the line are great as well. It is a most unusual tuberose indeed. Glad you like it too!